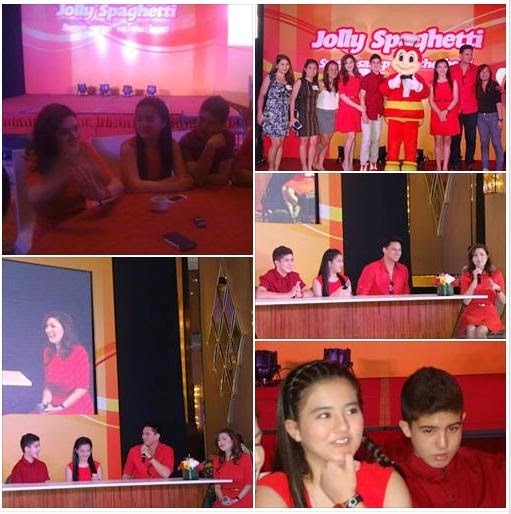 Actress Carmina Villaroel-Legaspi, her husband Zoren Legaspi, and their twins Mavy and Cassy, were formally introduced as the newest family endorsers of Jolly Spaghetti in an intimate lunch held at Fairmont Hotel, Makati City. Jollibee's choice of the Legaspi family to represent its product is without doubt ideal. As satisfied Jolly Spaghetti customers, they are the brand's best advocate. The Legaspi family offers a great example of how the distinct personalities of every member make the perfect blend of a happy Pinoy family. To them, Jolly Spaghetti is something truly worth coming home to and sharing memories over. 20 years ago, Carmina did a Jolly Spaghetti TVC when she was 13 years old. And now, she is joined by the people closest to her heart to reenact the Jollibee commercial that catapulted her to fame. Carmina was ecstatic given the opportunity to be back home two decades after her first-ever Jollibee endorsement. “I’ve loved Jollibee since I was younger and the Jolly Spaghetti has been an all-time favorite. I’m excited to be back with the Jollibee family. This homecoming is extra special because this time, I’ll be with my own family. Together with my husband and kids, I feel that we’re going to have the time of our lives sharing the langhap-sarap world of Jollibee with everyone,” according to Carmina. When it comes to the joys of langhap-sarap goodness, Jolly Spaghetti is one of the favorite dishes in Jollibee’s menu which the Legaspi family truly loves. “It has the perfect blend of flavors we Pinoys want in a spaghetti dish. It has a sweet-sarap taste with rich and appetizing tomato taste that makes me, Carmina and our kids want more!” says Zoren. It was a trip down memory lane as guests had a glimpse of Carmina’s first-ever Jollibee endorsement back-to-back with an exclusive preview of Legaspi family’s new TV commercial for Jolly Spaghetti. The new Jolly Spaghetti commercial is one in the same with the original except that the latter now incorporates the faces of her family. True to the Legaspi family’s taste, Jollibee has kept every Pinoy mom, dad, kuya, ate and bunso craving for the delicious blend of sweetness and rich tomato taste. Jolly Spaghetti's flavor together with the right amount of cheese plus meat makes it so amazing that kids couldn't wait to delve into it. This one-of-a-kind blend has captured the hearts and taste buds of Filipino families the world over, making it the Jolly Spaghetti that everyone loves: sweet-sarap na the best! Cheesiest, meatiest, spaghettiest!